FOR this coming fasting month, break your fast at the Shah Alam Convention Centre’s (SACC) new Ramadan Buffet. Some of the highlights in the spread of over 100 dishes feature items from Sumatera, region, Jawa, Lampung, South Thailand, South Philippines, Brunei and of course, Malaysia. In addition, the buffet will feature seven different menus to give diners the chance to sample all kinds of dishes. It’s a whole lamb stuffed with rice and roasted over fire. The lamb is marinated in various ingredients using the chef’s special recipe comprising turmeric, tongkat ali, ginger and Middle Eastern spices. Thanks to these ingredients, the lamb is flavourful and the rice is fragrant and tasty. Another must-try dish is the Ox’s Tongue Soup that is aromatic and tasty as it has a variety of spices. Some favourites like bubur lambuk and rendang tok will feature on the buffet line-up every day. Apart from the buffet, there will also be 10 live stations whipping up many local favourites such as chicken and beef satay, roast lamb, roti John, bakso, char kuey teow, ais kacang and pisang goreng. “At SACC, patrons will be presented with ala kampung style dishes. “While dining on the tasty offerings, diners will be entertained by a traditional Malay band performing Malay songs. In addition, surau facilities are available throughout the holy month and an imam will conduct the maghrib, isyak and tarawih prayers for guests’ convenience,” said Zulkifli. SACC will also be providing special packages for corporate companies to undertake their corporate social responsibility in conjunction with Ramadan. A tailor-made programme can be designed and is priced at RM80 per adult. The large venue can also hold up to 2,500 people. The Ramadan buffet is priced at RM75 per adult from July 17 to Aug 17. Outside catering is also available upon reservations. 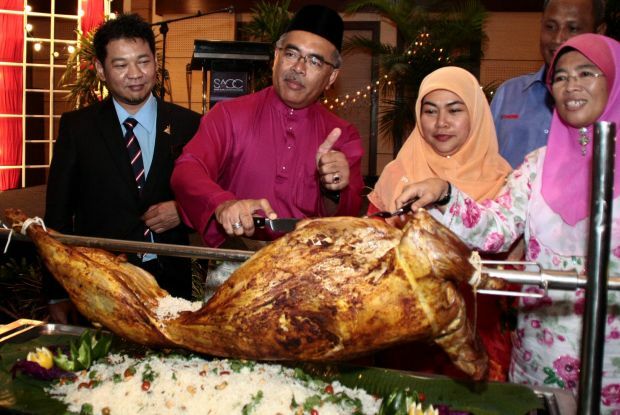 “For this Ramadan, diners will definitely enjoy the food here as we do this from our heart,” added Zulkifli.